Discussion in 'NW Europe' started by Ramiles, Apr 1, 2015.
by the way, do you have a picture of your father-in-law Sgt Austin Jones at any point? i.e. even after the war etc. There are quite a few pictures of 24th Lancers that I have variously seen but a lot of them I can't name, as I don't have enough examples of known (to me) pictures of 24th Lancers with which to compare them etc. "Description:A padre holds an open-air service for men serving with the 5th Battalion East Yorkshire Regiment in an orchard in St Léger before the battalion returns to the front-line. Sherman and Firefly tanks belonging to the 24th Lancers 'A' Squadron * move up towards the village of Audrieu and Point 103 (Le Haut D'Audrieu) in support of 69th Brigade's operations designed to outflank Tilly-sur-Seulles. Sherman 'Crab' minesweeping tanks (one minus its flail jib) from the Westminster Dragoons 'C' Squadron move up to the front past a self-propelled artillery position near Martragny. Here, Sexton 25-pounder self-propelled guns belonging to 90th Field Regiment RA's 465 Battery ('E' and 'F' Troops) lay down a barrage on positions held by the 12th SS Panzer and 716th Infantry Divisions in woods north of St Pierre." Nb2: If these 24th L firefly tanks belong to the 24th Lancers 'A' Squadron then one of them was perhaps Sgt Austin Jones's 24th L - A squadron - tank? Hi yeah we do have some I'll sort some out for you. As far as I am aware there were probably many similar photos taken of other meetings of the 24th L in later years that many people will still have etc. Pictures of members of the 24th L taken variously during the war seem to crop up quite regularly, every few months or so, and many people seem to have a few war time snaps of their 24th L relations etc. and often too occasionally some of their comrades / crew(s), though as time passes etc. the knowledge of who's who in which picture(s) can sometimes be lost. Which shows an A/Sgt Jones, A. etc. My father told me somewhat ruefully he had shot up the tower of the church at Audrieu, obeying orders of course, in case it harboured snipers. He was "A" squadron with tank commander Fred Bartlett, Radio Operator/Loader Tony Hughes and two young men who gave their lives a few days later in the driving and hull machine gun roles when the tank was hit on 26th June, Geoffrey Dean and William Heath. Dad was Peter Hancock. He also remarked that the fear of snipers triggered off a number of shoots where it was probably unlikely there had been any, but you didn't take chances after some of the early bad experiences of tank commanders being picked off. Ramiles and SDP like this. I think I have seen at least a couple of accounts of 24th Lancer tank commanders hit by snipers; Captain Alick Poole (A squadron) and Sgt George A.J.Taylor (A squadron) - both 8th June 1944. (mentioned p86 NHL) but I'm not sure how persistent a problem snipers remained for the 24th L after that. "In this session we learn about the horrific casualties sustained by the Regiment (SRY) as they fought their way through the Normandy bocage and towards Germany, and just to give you an idea of what David faced during this period, the average life expectancy of a Tank Commander was just two weeks. 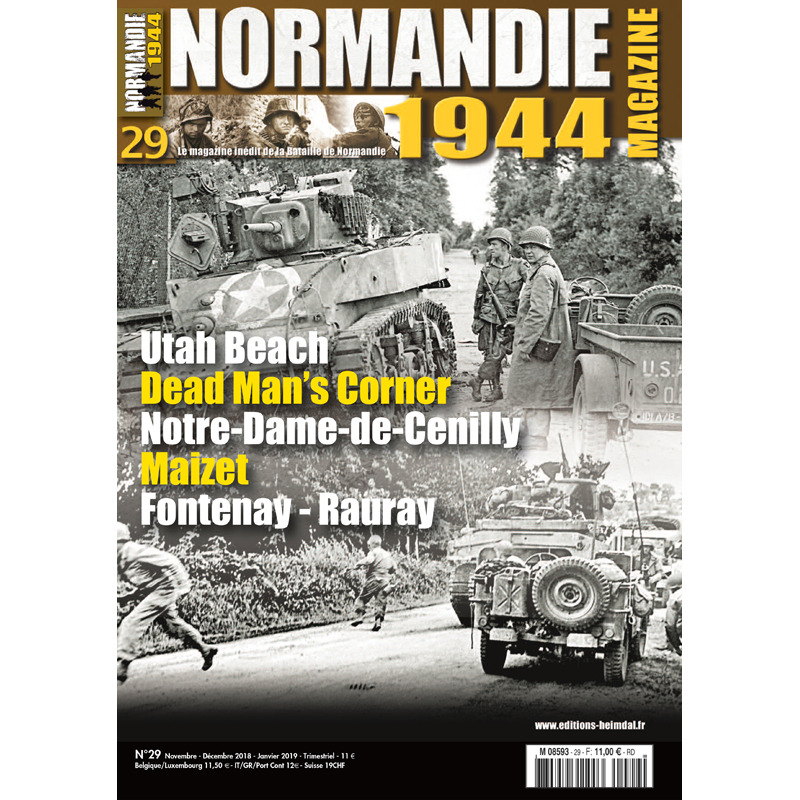 We also discuss the tactics employed by both sides, the constant threat from snipers in the bocage, a first encounter with a Panzerfaust, losing a tank on mines, a few tricks of the trade that helped keep David and his crew alive, Operation Pepperpot and much much more." Correct me if I'm wrong but wasn't George Taylor killed when Peter H and Tony Hughes were members of his crew? I know the snipers were female because Tony said so. "Another illustration was the 146th Brigade attack on 25 June 1944 on Fontenay-le-Pesnel and Tessel Wood. The regimental historian described the action: The early morning mist had lifted and the smoke and dust of the barrage on Fontenay had cleared away revealing another cloudless hot summer’s day, when the guns roared and thundered into action again. The barrage fell thick on the hillside beyond the village . . . [when] the 1/4 King’s Own Yorkshire Light Infantry . . . poured out of Fontenay village and swept on up the hillside, walking behind a wall of hideous noise and smoke and dust and flame which moved forward in jumps of a hundred yards at a time ahead of them. The Tessel Wood feature . . . was taken and consolidated, and a counter-attack the same evening was successfully beaten off. If one did not know better, it would be easy to believe that this passage related to the Battle of the Somme in 1916. All the ingredients were there - infantry closely following a creeping barrage, capturing a wood and then digging in to wait for the obligatory German counterattack – even the battalion involved, the 1/4th KOYLI, did actually fight on the Somme." My father never mentioned this event to me and George Taylor is not a name I know. I never discussed it with Tony either. It might explain why Fred Bartlett was an acting Lance Sergeant when in command of the tank. If thats what Tony told you then it must be the case. My father only mentioned snipers to me in oblique terms and not in reference to a particular loss or event. This has come as news to me, but I don't suppose I should be surprised as there was lots that Dad would just not talk about. We boys knew just not to ask as it was plain in so many ways he didn't want to go there. I do have a vague recall of Tony referring to an early loss of a tank commander being shot by a local as opposed to a German, but I have no idea who when or where, and I did not hear the whole story. After the disbandment of the 24th L he enjoyed playing Rugby, skiing etc and auditing after the war. There is something familiar about the face, so I might have seen him, or someone that looked very similar to him, in - for example - a group shot of some 24th L's. Do you know if he attended either of the first two meetings? Or one day you might be able to pick him out from there? The way that they were organised in the "hall" - I think appears to be by their squadrons perhaps, with maybe "C" in the foreground, which may put "A" squadron somewhat in the background, so it might be harder to pick out a face that is "further back". As I understand it also, a lot of the 24th L would have still been serving (in other regiments) in the first few years immediately after the war, and if still in Germany or overseas elsewhere - for example - in 1946/7 would only have been attending the meetings of the old comrades etc. in the later years, for which there probably will also be some photos, which might appear one day etc. He only started going to the reunions in the 80s with his old mate Harry Dews. Not any pics where taken then. Tony told me the graphic detail so would not want to repeat on a public forum. George's demise is told, I believe, in None Had Lances. I'm currently away - it's been one of those weeks - so can't check until tomorrow at the earliest. With: "Fontenay/Tessel/Rauray. Quatre jours pour “Martlet” 25-28 juin 1944 par Frédéric Deprun." He will have been at Tessel Wood (unless he had been wounded and evacuated). I have no information as to his Medal entitlements. That will be on his Service Record available from the MOD as will loads of other information. Note: I need to check my files for 'Jones': there was more than one of them and we need to ensure we are discussing the same Jones so we don't go up the wrong path. If you know he was a Tank Commander then in all probability he was in the Troop mentioned in my earlier post but I need to check (currently away from my files for a day or two). Apologies for my tardy reply but I've now, at last, got access to the 24th Lancers Nominal Roll. This is from the Nominal Roll effective D Day or thereabouts and confirms A(ustin) Jones details and rank. The G/M confirms his trade as Gunner/Mechanic. The next image confirms his role as a Tank Commander. I think this next image, which shows the A Squadron ORBAT (Order of Battle) effective D Day or thereabouts, indirectly confirms that George Taylor will have been replaced by another, presumably Fred Bartlett.